Overstock.com announced the launch of Eziba.com, a private sale website. Eziba.com features daily deals on the home decor products from many leading brands. The products will be offered in daily sale events starting each day at 11:00 Eastern Time. Each sale will last between 48 and 72 hours. A spokesperson said Eziba would not be adding categories beyond home decor at this time, and said no other private sale sites are being developed. 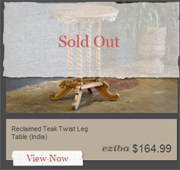 Eziba.com is not accessible through the Overstock.com homepage, but customers can sign up on Eziba.com using their Overstock.com log-in information. As with Overstock.com orders, an entire Eziba.com order ships for $2.95, and Overstock.com handles customer service for the site. Overstock.com President Jonathan Johnson said, "Overstock.com has relationships with a large network of suppliers, who are in search of different avenues to sell product. It was a natural progression for the O to build a private sale site."